Air supply or air return in Air-conditioning ventilating and heating systems. Especially in clean rooms in Pharmaceutical plants or in Hospitals and operation theaters. Overlapped in side wall or in false ceiling by means of hidden fixing systems. Extruded aluminium construction. Frames with flat frontal face of 16mm, 20mm or 30mm flanges and inner blades of 0º, 15º, 30º or 45º deflections. Inner blades assemble will be removed easily without using any tools by just push and fit method by means of plastic bushes. This can be helped to clean the filters inside the grille. Available in oneway or twoway as well as in standard or non-standard sizes. Utilizing our sophisticated facilities and extensive industry knowledge, we, Cosmic Equipments India Pvt. 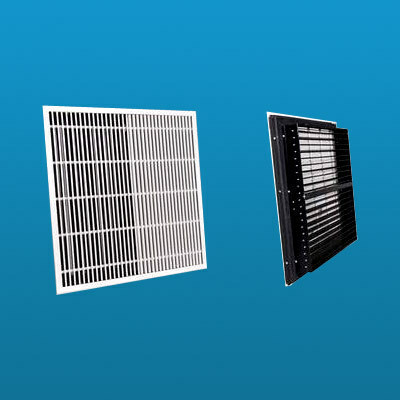 Ltd., design and supply a wide range of air terminal, HVAC air distribution system and air conditioning distribution such as grilles, diffusers, louvers, dampers, air diffuser, ceiling diffuser, that have earned us huge accolades from clients. More than two decades of industry experience as well as state-of-the-art infrastructure are few factors that allow us manufacture highly durable, cost effective and flawless performance oriented range of products. This organization was established by a wide experienced entrepreneur with ambitious plans and assisted by a team of top technocrats in the line who assures the delivery of only superior products. Maintaining a streamlined quality control process, we have been able to dispatch only qualitative products and have gained us association of some reckoned Air conditioning companies. We are looking for queries from Chennaipattanam, Chennai or Madras, Kanchipuram and Tiruvallur.